A museum in the former home of Empress Marie-Louise recounting the story of Marie-Louise and Napoleon I through documents and various objects. Professor Glauco Lombardi (1881-1970), Italian author and art historian, devoted his life and energies to the recovery, study and conservation of anything related to Parma under the Bourbons (1748-1802, 1847-1859) and Marie-Louise (1816-1847). In the period from 1915 to 1943, the kernel of the original Lombardi Museum was housed in the ballroom and adjacent rooms of the Palazzo Ducale in Colorno. 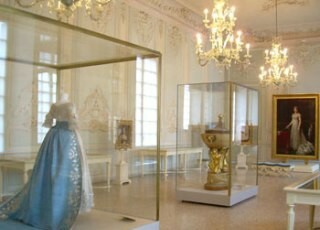 In 1934, the collection was significantly enlarged by the acquisition of objects belonging to Marie-Louise in the collection of count Giovanni Sanvitale – Giovanni had received them from his grandmother, Albertina Montenuovo Sanvitale, herself the daughter of Marie-Louise by Neipperg. After closure during WWII, the museum reopened in new premises in 1961, in the Palazzo di Riserva in Parma under the name of Museo Glauco Lombardi. The museum had now also become a Foundation, under the egis of the city of Parma and the local parmese cultural banking foundation, Fondazione Cassa di Risparmio di Parma e Monte di Credito su pegno di Busseto. Over the years from 1997 to 1999 the museum was totally refurbished and provided with a modern, bilingual website. Further details concerning the museum, visit the museum website.